The Cloud Sharing concept began as a 1991 brick'n motar 2-for-1 Jean Exchange(s) where we discovered a simple formula & test for appraising intrinsic asset value in unwanted jeans. Cloud Sharing Parity is ONE-FOR-ONE. Similar or dissimilar goods of equal value. Sharer retains 100% of the value and can spend, share or donate your Cloud Sharing Currency within the Cloud Sharing Network. You already own JeanBank/CloudSharingBank stock – find out what it’s worth and put it to work! VIEW CLOUD SHARING BOXES! Cloud Sharing turns everything into an asset! Unwanted Goods (to start) Become Assets! Billions and billions, perhaps trillions of dollars in unwanted assets are stored away in 7-out-of-8 homes and businesses around the world. These assets possess valuable intrinsic qualities but are currently of indeterminate worth. The Cloud Sharing Bank, using input from a network of specialty sites like JeanBank.com, creates and establishes a 'Perception of Value' where none now exists by appraising assets at generous Fair Market Values based on original M$RP (or current retail market), condition and interest/demand. Depositors virtually deposit unwanted assets making them available 'for withdrawal' to other Depositors and while no cash changes hands (except P&H), each Depositor's JeanBank account reflects a real cash-like transaction. JeanBank facilitates the physical transfer of assets by virtually performing typical bank services. Cloud Sharing of Assets = New Socially Relevant Shopping/Sharing Experience utilizing appraised asset value to Share, Save, Shop, Conserve & Recycle. No longer must consumers succumb to the cutthroat intermediaries who prosper buying assets by the creed "Buy low, Sell high!" A complex combination of emotional, psychological, social and physical needs drive the primary domestic shopping experiences beyond one-billion dollars a day acquiring new goods that displace assets with considerable intrinsic value but no common market. Add to that sum all the held assets people choose not to dispose of because of their perceived worth (including purchases of consumer goods, collectibles, hand-made creations, art work, memorabilia, antiques and more) and you have a monumental inventory with global appeal for zero cost and without expense to consumer/Depositor. JeanBank is an updated Ebay-like platform combining auctions and stores (buyer & seller markets) while promoting a broad range of unique acquisitions utilizing a virtual currency! (drafted for casual clothing industry - Cloud Sharing Bank will appraise ALL ASSETS (except instruments of violence))! of any value they no longer need thus making goods 'Available for Sharing' by other Depositors. where physical assets, not cash, create the Cloud Sharing Currency. - all the services a bank performs in the normal course of business and a few more. Primary retail consumers of non-durable goods like clothing spend more than one billion dollars a day, yet the residual value of those goods is only 0.0025 percent. Why? The thirty-five ($35) billion dollar secondary market is controlled by three 501c3 organizations (and for-profit Savers Inc.) that account for 97+% of secondary sales. They determine the 'real world' selling price of these goods/assets that cost them nothing and set market parameters for consignment and resale stores also in the secondary market. Conversely, 97+% of primary consumers receive nothing ($0.00) for 'donated' goods that often cost big bucks and still have significant intrinsic value. By law, 1.5M 501c3 non-profits cannot determine a value for these donations and thus all goods, regardless of cost (Walmart to Nordstrom), are usually sold at one low price. Our initial concept and current working model is largely based on the clothing industry but will be expanded to include all assets under the Cloud Sharing Bank umbrella. We create a sub-primary retail market where asset appraisal/valuation is based on MSRP replacement cost or owner's perception of value. ii) Isn’t this the secondary market? i) What’s in the box? iii) What’s in a name? redeeming assets with substantial intrinsic value through collaborative consumption. * Utilize social media network to promote consumer, brand and/or retailer trends. * Provide services to and chronological archives for consumers, retailers and manufacturers. * Empower consumers with new ways to Save, Conserve, Recycle, Look and Feel Absolutely Marvelous! 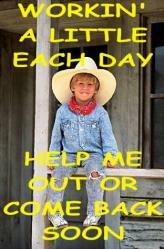 * Open the 501c3 market to virtual donations while improving & increasing assistance to the needy. while providing consumers with information on brand names sold through domestic retail stores. JB also creates a market, currently non-existent (except ThredUp.com where Goldman Sachs just invested $81 million), for post-purchase consumer goods. From birth to death most of Earth’s 6 7 billion humans cover their bodies from head to toe with branded apparel manufactured as gender and age specific product lines for consumers to purchase from budget, moderate, better or premium retailers. Significant retail revenue comes from apparel, footwear, sportswear and accessories markets where domestic consumers spend about a billion dollars each day on ‘soft’ goods. COST is the top purchase driver for apparel; overall, 84% of consumers named price as the single most impor­tant factor in choosing their purchases according to Cotton Incorporated’s Lifestyle Monitor. JeanBank promotes brand product lines and identifies with the retailers selling them but also adds a new ‘FREE cause you’ve already paid’ tier to the price structure by creating a market for nearly new, previously purchased goods no longer meeting consumer requirements. Initially JeanBank includes casual goods comprising more than 50% of the outlined segments. When social media first emerged, it was a platform for communication, for sharing information and life updates with friends and for building new connections. A shift seems to be happening however, as social media emerges as a place not so much for conversation, but for sharing links and now goods and services through collaborative consumption. There has been a noticeable drop in the amount of conversation on Twitter, for example, and a huge rise in the amount of links shared. JeanBank uses social media to reach consumers searching for specific styles, brands and sizes by making it possible for them to capitalize on past purchases no longer serving a useful purpose. Goods, like jeans that are often identifiable by their tag & pocket, have armies of faithful consumers that inspire and support our collaborative vision! JeanBank (JB) targets primary purchasers before they dispose of valuable goods no longer serving a purpose. Our goal is familiarity with potential Depositors before this occurs by being their source for pre-purchase information on brand product lines and retailers. Consumers pay hard earned cash for goods and appreciate original cost, perceived value, and remaining usefulness; these are unvalued goods not without value, hidden assets with intrinsic value but no visible market or worth. JB simply gives them an acceptable Fair Market Value. This portion of the JeanBank website is operational and includes current, classic, designer, vintage and collectible items. For those who don’t wear pre-owned goods JB plans a unique way of virtually donating to a favorite charity or non-profit while adding their goods to the universal JeanBank pool. For a microcosm of this target market we suggest a stroll through any successful mall. One such mall in Cincinnati is the Kenwood Towne Centre anchored by Macys, Nordstrom and Dillards department stores; additionally nearly all of the retailers cited herein maintain one or more stores there. If possible, view the businesses from the perspective of the consumer, the manufacturer and the retailer for a better understanding of the market. Tally all of the purchases made there in a day, week or year and for every $100 spent the current residual value is only $0.25 – one quarter - a value we attribute to research firm NPD Group of Port Washington, NY (2003). COLLECTIBLES ~ HANDMADE & DESIGNER ITEMS ~ People collect, inherit and own all sorts of goods they eventually tire of and store in drawers and closets for lack of an alternative. Not everyone wants to hassle with auctions, trade shows, Craigslist or such so many semi-valuable items end up collecting dust. JB initially targets collectors who can ‘price’ items with a fair market value for trading or donating like jerseys, hats, belt buckles, T-shirts featuring basketball, football, baseball, soccer, hockey, music, schools, organizations, associations, teams, brand names, cities & locations, comics, Disney, Harley gear, jewelry, military, the infamous and more. If you can give it a price its JeanBankable! JeanBank’s Old Blue, for example, has expertise is vintage clothing and specializes in denim that is bought and sold by global boutiques and collectors at the Rose Bowl in Pasadena on the first Sunday of each month. What’s a fair market value for today’s vintage denim? (see Collectible/Vintage category @JeanBank.com) In the 1980s Japanese Boom magazine featured young fashionistas wearing high priced vintage jeans, gym shoes, shirts, and accessories. Featured articles included boutique visit, interview with owner, subject’s school, family, friends and a history of fashionista’s 1952 501 button-fly, buckle-back, hidden rivet $3,400 Levis and how they differ from the ’63 model. The article contained details on the $1,600 1st edition Air Jordan Nikes being worn and don’t forget fashionista’s piste de résistance, a $5800 Lee buckle-back denim jacket - that’s just one collectible market we intend to cultivate. Curiosity brings traffic. What could seem ostentatious in the USA may be a super-trend in China, India or Russia as they experience Denim Booms! WEIGHT GAIN/LOSS ~ JeanieB, of JeanBank, is a university neophyte well aware of the ‘Freshman 15’ pitfall where new college students reportedly gain an average of 15 pounds their first year. An episode of Seinfeld hilariously dealt with Jerry’s vanity and his traumatic transition from 31” to 32” Levis and there’s traditionalist Cowboy Bob’s dilemma that follows, all confront the common problem of weight gain and the need to replace goods. In each case, goods of significant quality are no longer useable due to a change in consumer’s waist size. The NPD Group asked 3400 jeans owners (who owned an average of 8 pair each) why some went unworn; 18% responded “no longer in style”, 16% said “too large” and 48% declared “too small”! QUESTIONABLE PURCHASES ~ A complex combination of factors motivate consumers to buy goods and occasionally they ‘own' questionable purchases when the manufacturers tags are removed or a receipt is lost. Wrong waist, length, fit, style, color or gift are common errors made by consumers who often keep, rather than return, goods that are useless to them. There is no market for these goods and they immediately loose 99.75% of the original purchase price regardless of brand, use or condition. THIS ENORMOUS DISCREPANCY IS OUR WINDOW OF OPPORTUNITY! FYI ~ As part of a classroom experiment Canadian college student, Josh Le, wore his new Nudie jeans 330 times over 15 months before he washed them the first time. While the average pair of jeans last 18 to 60 months (unworn they last forever), the capacity to wear them varies greatly and herein rests a major need for JeanBank. In general, goods from more affluent consumers with larger wardrobes tend to receive less wear and last longer. TOGETHER available goods in excellent condition create a new pool of potential Deposits in the billions of dollars. Very little research exists but the NPD Group did find 42% of apparel purchases retained a significant portion of their original quality one year after purchase. CURRENTLY THERE IS NO SERIOUS MARKET FOR THESE GOODS SO THEY HAVE LITTLE OR NO VALUE. That’s how our competition sees it. SINCE THE ORIGINAL WRITING of this business plan, Thredup has again changed their format TO RESELLER & CONSIGNMENT paying as little as 10% to sellers while accepting only 50% of goods! Their inexperience and mistakes continue to doom the Tredup site, in our opinion. In 2009 a couple of Harvard Business School students were brainstorming and saw a need for a website where adult shirts could be exchanged. They put together a plan that was runner-up in the annual Harvard Business Plan contest, the Capstone of the school’s MBA Entrepreneurship curriculum. With $300,000 in start-up money they launched ThredUp.com but soon realized it wasn’t working the way they anticipated. Their initial formula sold pre-paid USPS boxes to customers who filled them with shirts to trade to another customer for a service charge; put one box in, take one box out. The shirts themselves had no perceived value they simply comprised one box. Armed with $1.4 million they discovered their concept was best suited for children’s clothing. Put a box of 2Ts (age 2 toddler) in and pull a box of 3Ts out and pay ThredUp a $9 to $16 service charge plus postage. Business is good. By March/April 2011 ThredUp.com was receiving about 600,000 hits a month, had 4,500 boxes in inventory, had shipped over one million items and was enrolling about 1,000 moms a day. ThredUp could not crack the adult market (see Cons below) and has chosen to expand horizontally, recently launching a mommy-baby blog called DailyThred. ü ThredUp does not permit pictures of goods. A picture’s worth what??? JB believes consumers want to see what they’re getting! Harvard Kicker – JeanieB believes the HBS grads missed the Mother Lode! When you create and control the Perception of Value you gain the ability to create wealth for people! The more goods are worth the more valuable a service becomes, it’s the ‘Mother Lode Secret’, creating wealth for 7-out-of-8 primary consumers from goods perceived as worthless. MINOR COMPETITION - Brick and mortar competition includes for profit consignment shops and resale stores. There are also for profit businesses that rent charity names for a small percentage, AmVets for example (3%). Their role is so minor we do not consider them competition. Online auctions may include new or pre-owned goods and at this writing Ebay has listings for 751,210 jeans of which 128,511 are auctions. Over 95% end up at one of the big three non-profits; Goodwill, Salvation Army and St. Vincent DePaul. ISN’T THIS THE SECONDARY CLOTHING MARKET? In general secondary retailers do not recognize brand names or the price differential in their cost. Our goal is to access goods before they’re given to charities and non-profits comprising most of the secondary market! People donate goods, probably because they have no other options, using the convenient garbage bag for transport. A fatal curse condemns the brand identity, quality, and care - all the valuable characteristics – to obscurity when only nameless arms or legs emerge from the bag! Sorters empty bags placing bottoms in one basket and tops in another with no regard for their intrinsic value. Secondary stores generally sell goods the same way; bottoms for one price, tops another. They do suggest a very modest tax-deduction (jeans $4-20) but they simply give you a blank form because 501c3 charities and non-profits CANNOT determine a Fair Market Value for any donation. As a third party JeanBank can determine a Fair Market Value providing primary consumers with significantly larger itemized tax-deductions and a new cash-based-perception of goods. FYI ~ PICKERS profit by knowing the value of goods! They shop charities and non-profits on a daily basis for themselves, resale shops, consignment shops, flea markets, online sales and auctions, etc. Pickers hunt ‘the good stuff’ and as a result these goods will be sold within an hour of being put on display. On a good day pickers may shop 10 to 15 different stores. We know Japanese buyers who rent a van on one coast and drive cross-country picking and shopping as they go. At turn-around they’ll ship those goods home and head back across the USA or turn the van over to another team. Keeping JeanBank cashless (at least to start), except for donations, eliminates the pickers who make a living understanding the Perception of Value in cash terms. JB CLOTHING BANK operates like a collaborative bank virtually accepting Deposits and Withdrawals of Savings Boxes. JB controls the flow of credit and the Perception of Value by treating unvalued goods as assets, appraising them much as one would durable goods like pre-owned cars where resale value is based on original cost, wear and the appeal of a particular brand or style (three pre-owned cars sell for every new one). Depositors determine a cash-based value for collectibles even though no cash trades hands; the Perception of Value is framed in cash. WHAT’S IN THE BOX? HOW CONSUMER DEPOSITS & WITHDRAWALS WORK ~ JeanBank appraises post-purchase goods and credits the Depositor’s bank account for their replacement value, which can be redeemed or transferred. Once a box has been filled and a Fair Market Deposit Value determined and accepted the Depositor can use their JB balance to Withdraw another’s goods, donate the balance to a charity/non-profit or transfer to friends or family members – collaborative consumption. The Deposit process is complete and works well. For consistency and to eliminate the variable of postage JeanBank initially utilizes the medium size United States Postal Service flat-rate box as our transaction vehicle (as does our competition). The USPS/JeanBank Savings Deposit Box holds a mini-wardrobe containing four pair of adult bottoms or two pair of bottoms and four tops, and so on up to Box 262, which holds 27 assorted children’s items. This box ships for about $10 to all states, all U.S. possession and all military addresses served by the US Postal Service around the world and eliminates distance and weight as expense variables. Postage paid through PayPal, for example, makes international shipping easy and brings global markets into active play. JB is a friend, source and service to retailers and manufacturers. Industry databases with significant contact information are readily available as is 501(c) database. In addition to email and zip code information that can be used for direct marketing, JeanBank forms a personal profile about consumer habits - favorite brands, dream brands, favorite retailers, dream retailers, style preferences, changes in physical measurements, household makeup, and more. DOWN THE ROAD ~ JB sees consumers shopping stores and boutiques around the world live from the comfort of home. Global sales staffs equipped with micro-cameras taking virtual customers through their stores on personal shopping excursions. A boutique in Osaka or maybe Paris, each is as close as next-door. JeanBank will act as a facilitator and guarantor for both. Note: JB Clothing Bank ~ mechanically this feature is complete and works very well. It is the most difficult part of the website besides jean tweets. It provides gender and age specific product lines and related MSRP price ranges that are part of Deposits and retailer, manufacturer databases. NO CASH ALLOWED! People risk nothing they can use and recycle money they’ve already spent. 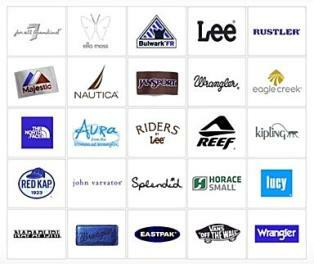 JB welcomes all nice bottoms, tops, sportswear, footwear, outerwear and accessories consumers no longer wear or use in any age, gender, brand and item combination! JeanBank’s formula (or Depositor) determines Savings Box Deposit Value. M$RP ~ Included in the beginning JB database are M$RP ranges taken from retail brands carried by Macys, Abercrombie, Nordstrom, Dillards, Diesel and 7 for all Mankind by gender, age, item and department (product lines) - M$RP ranges come from company websites. The original retail price or Depositor’s best guesstimate determines Deposit Value regardless of cost. Deposit Values are suggestions and can be changed by Depositor. CONDITION ~ How much wear have goods experienced – how much life have they lived? JB adds a kicker to cash donations by affording donor the additional satisfaction of providing clothing to someone or family in need. DONATIONS, CHARITIES & CELEBRITIES ~ JeanBank makes it possible for any of the one million 501c3 groups to virtually accept donations and turn them into cash by giving personal goods displaced by new purchases a Fair Market Value (FMV) based on intrinsic qualities and demand. When a third party accepts FMV the donation is confirmed. This adds Deposits from consumers who don’t wear pre-owned goods and makes it possible for cash donors to give to their favorite charity or non-profit while personally helping a family or individual obtain needed clothing as a bonus. It’s a simple concept but has the potential to help millions of Needy. One means of raising money for good causes is for JeanBank to sponsor charity auctions of jeans and goods donated by celebrities. JB also promotes causes like Lee’s Denim Days to raise money for breast cancer research or Jeans for Genes for children’s genetic research – two of the many worthy projects that allow employees to wear casual jeans to formal offices for a donation. MANUFACTURERS & RETAILERS ~ “Macys ‘Thanks for Sharing’ and ‘Believe’ campaigns raise $16.25 million for charity”, “Nike gives $37.3 million to 4,500 charitable organizations”, “Lee National Denim Day (VF Corp) raises $52 million for Breast Cancer Research”, “Kohl’s gives $3.25 million to non-profit youth services”, “Levi Strauss creates a $100,000 denim insulation fund” – companies ‘give back’ to the community in many positive ways and one of JeanBank’s features enables virtual donations to 501c3 groups; raising money and clothing the needy. Hmmm, wonder what co-operative projects JeanieB will cook-up with the Big Boys? THE JB CLOTHING BANK A 501c3 cannot determine a FMV for donations so JB becomes a middleman determining FMV giving consumers who may not wear pre-owned items a reason to donate online to a favorite group. There are one million 501c3 tax-exempt groups in the USA but generally only three big non-profits control apparel donations, usually made in garbage bags, assigning similar goods equal values; bottoms one price, tops another; quantity but no quality; free to charity and of no value to donor, that is, donor receives only a blank form for goods, no remuneration. That's it in a nutshell! Donating Buddies Win, Win! Charity/non-profit raises money and Needy receive needed clothing as a result of JeanBank participation. By creating a universal pool of goods with Fair Market Values the chances of finding what you need increases greatly. There is an advantage to being ‘first’ with a totally new concept. The JB Clothing Bank provides a new, socially relevant public service that helps nearly everyone from the needy to the wealthy as they cloth themselves, their families or acquaintances without spending money for new goods. Google “swap kids clothes” and a plethora of media attention for ThredUp.com is apparent. It has been featured on ABC, NBC, CNN, FOX, CNBC, etc. plus there are numerous articles to a niche website serving less than 7% of the population. The goal of nineteen-year-old JeanieB is to dominate the other 93% through Inspiration and Priceless Word-of-Mouth Marketing by her twenty-first birthday. With so much happening online, the concept of marketing has shifted from traditional advertising to word of mouth and social marketing. It relies on the power of influence and trust to effectively reach out to people within different spheres that are difficult for manufacturers and retailers to penetrate. Our social media marketing tools include blogs, Twitter, Facebook, Digg, Reddit, MySpace, and YouTube and will be targeted for penetration and user visibility but because marketing and momentum are so important only a nameplate shell is currently in place with each awaiting professional direction. Social networks provide the freedom for JeanBank to increase outreach by using these platforms creatively to integrate consumers, brands and retailers through new avenues of expression and exposure but we intend to do it with forethought and good planning. Consumers crave pre-purchase hype and post-purchase exhibition so JeanBank embraces existing marketing and provides a ‘reason or excuse’ to show-off goods (and oneself) while providing detailed information, feedback, personal reviews and endorsements on brands and the retailers that sell them. 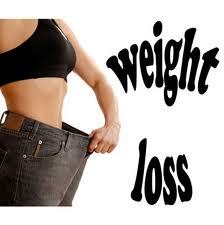 We also sell a service to groups: weight loss industry, schools, uniformed workplaces, etc. Consumers trust peer reviews or personal interactions more than advertisements. This information is not currently available. The average consumer disposes of 68 pounds of clothing each year, according to Levi Strauss. JB promotes ‘green programs’ like American Eagle’s recent two week 20% recycling discount if you bring in jeans you no longer wear. JB can develop and market additional Green programs by working with retailers and manufacturers. Retailer identity is carefully crafted so JeanBank provides a virtual rendition of stores for consumers to visit. JB features brand product lines including M$RP by department or specialty. Retailers have two priorities: 1) keep current customers happy and 2) attract new customers. We market ourselves as a friend and ally to retailers and sell them support services. Manufacturers live and breathe brand identity so JB sells the ‘company product lines’ to consumers by gender and age. By actively using the MSRP (manufacturer’s suggested retail price) for several features we help establish a brand’s identity and position (price points) in the market plus we provide consumer generated endorsements, reviews and helpful information on availability. We market ourselves as a friend and ally to manufacturers. WHAT’S IN A NAME? Does it tell you what we do? Is it easy to remember and memorable? Is it cute? ü Is it a Bank for jeans and maybe more? o By association, consciously and/or sub-consciously, with universally recognized Gene Bank where Deposits of Human DNA information, The Secrets of Life Itself, are stored. Blue jeans contain and display each Persona’s Source of Life. Weight Watchers, Herbal Life, Nutrisystem, Jenny Craig, Smart for Life, LA Weight Loss, Spark People, Joy Bauer Diet, Atkins Diet, South Beach Diet, etc. - all promising to change your waist measurement and there’s no better way to show off a slimmer you than ‘new’ clothes especially a new pair of blue jeans (and no better place to shake your new jean assets than with a JB video jean tweet), but how much can or should you spend on new clothing? And what about clothes that are now too big? JB Clothing Bank appeals to anyone who gains or looses weight and can no longer wear goods they own. We begin by marketing our service to groups such as weight loss organizations and schools where rapid changes in physical size are expected. The expense of buying new goods like jeans can be a psychological barrier to weight loss, especially for those on a modest budget, yet this multi-billion dollar industry offers no support and no options for a dilemma each person hopefully encounters multiple times - spend money you can’t afford to look good, or wear cheap? You’ve sacrificed for months and want everyone to see the new you. The ‘less-overweight than before’ person wants to show off a slimmer body and may splurge on better goods only to feel guilty about the expenditure or may be forced to opt for economical, sub-standard (for them) temporary goods that do little for one’s appearance and self-esteem. It’s a dilemma JB solves. DEPOSITS – CLOSED GROUPS ~ In general, all Deposit boxes are available to anyone, anywhere and go into the Universal JeanBank Pool but there are times when you want to keep goods within a group. School uniforms, for example, and large groups like local weight watcher meetings can save the expense of postage by keeping transfers in-house. We suggest one day a month as in-house JeanBank Day. Our Jean Exchange store at Traders World Market, Monroe Ohio, carried 10,000 jeans, mostly Levis, to serve the 25,000 customers we engaged every weekend and we turned inventory every six weeks or so (we also did a 2-for-1 trade for many customers). Start-up – Mid-January 1012 an ideal test month begun by challenging members of fifty 501c3 groups to add two boxes each for the Needy. JB anticipates a turn of inventory/Savings Deposits every six weeks will offer a sustainable variety and selection of goods for all. Each box may contain 4 to 25 disparate items that can be displayed separately by gender, age, item, style, material, color and condition. Categories are similar to Ebay but searching for goods more definable. Current core db is basic and complete with drop down menus but needs more product lines (data entry), a new site design and expansion to include planned consumer, retailer and manufacturer interactions prior to launch. Databases for manufacturers, retailers and 501c3s will be purchased from industry sources. IMMEDIATE OBJECTIVE ~ JeanBank.com needs $10-15,000 to launch (programmer, designer, social media expert, WordPress expert and PR firm) on a shoestring. Industry support should be available after launch if we are able to keep the site free-of-charge as a public service. Knowledge, experience and recent competition have convinced us an enormous, undiscovered market lies within our grasp. JeanBank.com can serve the Needy to the Wealthy as everyone joins in a collaborative consumption effort. SITE DESIGN ~ THE NEXT STEP JeanieB has been experimenting with the Wordpress ‘Blue Jeans’ template exploring content, looks and function but a ‘from scratch’ new and different site may be a necessity. SIMPLICITY of design our first goal (K.I.S.S.). Take a moment to explore our categories to Save, Conserve, Recycle, Look & Feel Absolutely Marvelous and you’ll get a feel for our Green content. EXPERIENCE – Father and daughter have over 50 years of primary and secondary apparel experience as retailers and manufacturers’ representatives. NOTE: Brands generally rebate 5 to 8% back to retailers for co-op advertising. This money traditionally went to newspapers but their demise has retailers scrambling for new exposure. It may represent a significant source of income for JeanBank. LEVI STRAUSS (#2 in sales - $6B) sells one brand name with incrementally priced goods. Take denim jeans for example: Four different Levis shoppers, four MSRP price ranges and vintage Levis add a collectible fifth market. VF premium jean lines include 7 for all Mankind, Nautica and Rock & Republic and their Wrangler Pro Rodeos are considered by many as the only true cowboy jeans in existence. You’ll find Rustler jeans at Walmart while vintage Lee denim brings just as much as vintage Levis. As each manufacturer grows they make a business decision to expand product line horizontally or vertically in a given market. They may start with a denim jeans line and add other bottoms or they may sell only jeans and choose to add tops. JB services all big and small brands and their individual product lines. JB knows paying $300 for a pair of jeans may impact more affluent consumers just as deeply as a $30 pair of jeans impacts someone on a modest budget. JB provides a neutral atmosphere that respects and maintains the cost differential of goods. We haven’t included budget/discount retailers because goods tend to be worn more often and more vigorously than other segments but JeanBank offers the same benefits proportionately priced to all. What retail distribution channels do manufacturers use to reach consumers? Why do consumers buy from certain retailers and do they buy online? According to Bloomberg.com (12/23/2010) the Internet now accounts for 19% of all apparel sales (up from 3% in 2003). Nordstrom is an upscale department store that carries 32 different women’s denim brands all included in the initial JeanBank database. You’ll notice 27 premium brands have a minimum price exceeding $135 (premium jeans for adults cost over $100 and for youth over $70). It is an erroneous misconception to believe consumers purchasing these goods will only buy ‘new from the store’. The expense of buying premium goods creates the same demand in upper income consumers as the rest of the market and premium goods tend to last longer because they’re worn less often due to larger wardrobes. Targeting goods from the original purchaser increases secure, positive feeling of exchange due to familiarity and trust factors. Traditional consumers generally purchase the same brand and style for a significant span of their life. 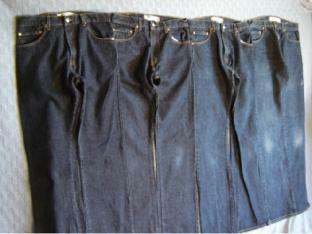 Bob began wearing Levis when he was 15 and by 22 he filled a 32” waist. He buys three pair for work and one pair for Saturday night and wears nothing else. Soon after his 30th birthday four nearly new 32”s ended up on a shelf after becoming suddenly tight. Bob assured himself the increase was only temporary. Four years later he moved on to a 34” waist and out the door went the four 32”s but to where and for what? No options currently exist for consumers having goods with intrinsic value like Cowboy Bob’s 517 Levis. He has to give them away for nothing. One pair, Bob’s Saturday night Levis, are like new jeans costing $40 everywhere. Would Bob pay $28 cash for like new Levis in the proper size? Indeed, he’d save 30% and speaking from years of experience it’s an easy sale given access to the primary shopper. Bob’s Perception of Value should be $28, not worthless. At JeanBank.com Bob’s total Savings Deposit is worth $138*, not in cash but as an appraised replacement cost he can use to obtain goods of similar value. The key is access to the primary consumer, impossible before the Internet and now only a scan away. The Perception of Value is built on tangible factors logically appraised after meeting JeanBank criteria. Depositor Bob has a Fair Market Value Perception the equivalent of $138 cash from perceived worthless hidden assets. Interest in Cowboy Bob’s Savings Deposit Box 382 will be high. Bob’s original purchase represented less than 1/6,000,000th of an average day’s purchases. To the best of our knowledge, no one has determined a FMV for goods with intrinsic value prior to JeanBank. business plan draft REVISED PLAN WILL INCLUDE ALL ASSETS! !